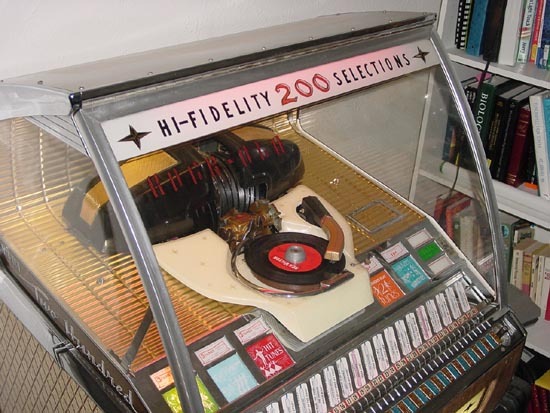 My mother has a pretty nice collection of 45 rpm records and has always told me she wished someday she could have a jukebox to put her records in. We'll her wish came true in the winter of 2001. While attending the December 2001 Super Auction in Mesquite I fell in love with the cute little Rock-ola 1462 that was to be auctioned off that afternoon. 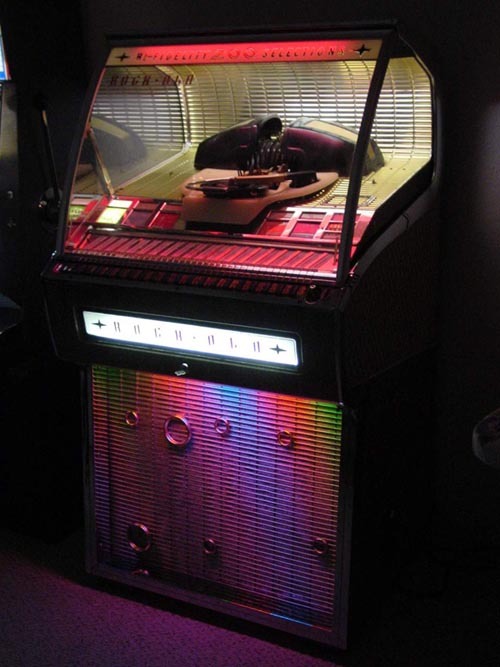 The 1462 is a 50 selection model and this one was in beautiful cosmetic condition, loaded with oldie 45's and was working for the most part with the exception of having trouble making selections. Low and behold, I took the plunge and purchased the juke. 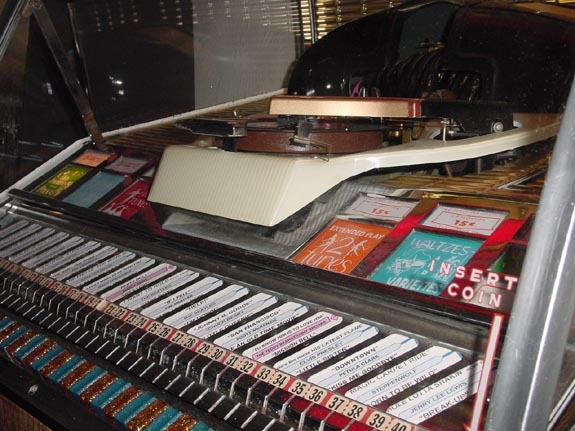 Since then I have cleaned the pin selection bank, got the machine working properly and have since sold the jukebox to my parents for what I had in it. Although shortly after the juke was gone from our house I noticed I was hooked! I wanted my own! 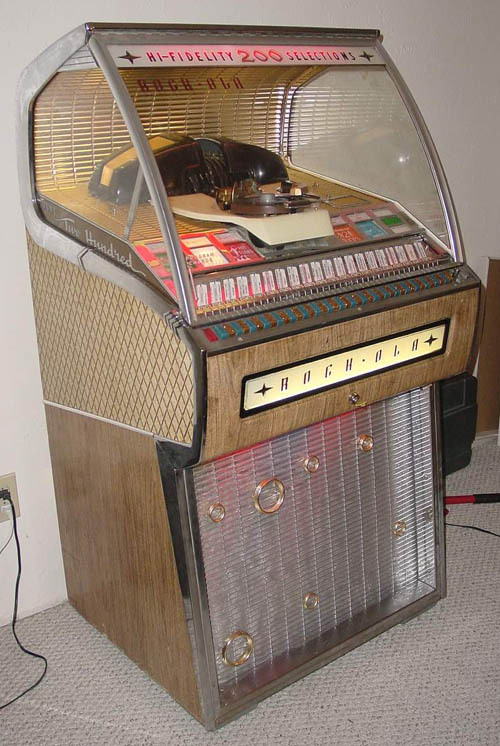 So the quest began to find a suitable jukebox for my families household. Some of the specifics I was looking for was: visible mechanism, at least 100 selections and I wanted it to be a Rock-ola since to me they seem the easiest to work on. In June of 2002, the quest was over! 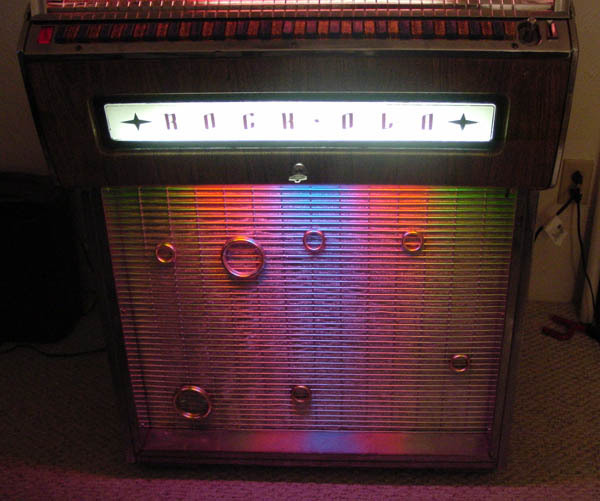 While searching through the Internet I met up with a fellow in Canada that was selling his Rock-ola 1455-D(eluxe) Jukebox. 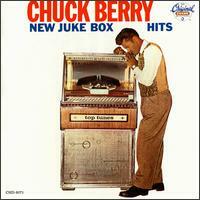 We negotiated on a price and I had the jukebox shipped to the (DFW) Pilot Air Terminal. About a week later the juke arrived in Dallas and me and my friend Eric went to Pilot Air to pick it up and bring it back to my house in Arlington. 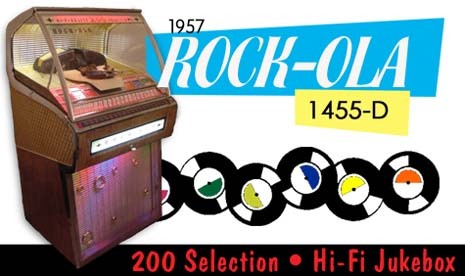 Currently we have it loaded primarily with hits from the 50's and 60's including The Beatles, Elvis Presley, Ricky Nelson, Jerry Lee Lewis, The Crystals, Lou Christie, Dion and the Belmonts, Buddy Holly, Petula Clark, Steppenwolf, the Big Bopper and Patsy Cline to name a few. The 1455-D is a really nice juke in my opinion. It is one of Rock-ola's first Hi-Fidelity jukeboxes and unlike the 1455-S it can play extended play records. Here is a picture of the switch setting for changing selections from standard to extended play (EP). 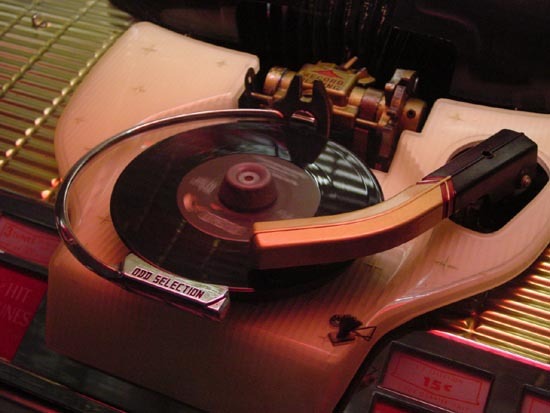 Extended play records offered listeners three songs per side as opposed to the the typical one single per side. The mech area of this juke is really nice with lots of fancy gold foil, chrome, nostalgic category titles and most importantly a visible record playing and selecting mechanism. 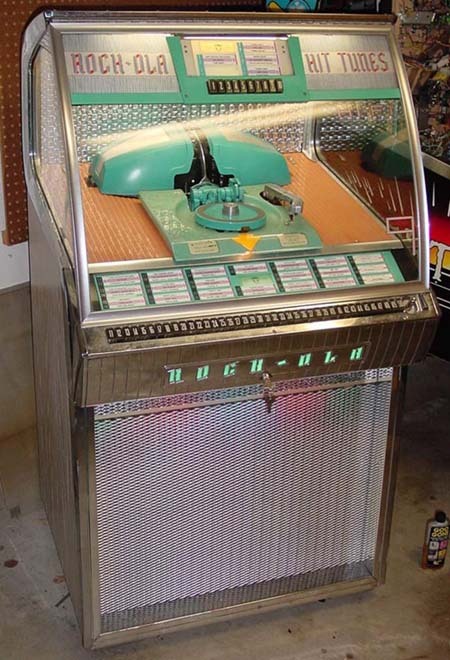 Although this jukebox is mono, I have upgraded the jukebox with a stereo cartridge & needle, as recommended by Victory Glass. Click here to see a movie of the mech in action! Wow! The sound on this juke is impressive, clear, and could easily fill a band hall. 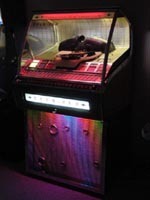 As you can see in this picture the grill is illuminated by a rainbow of colors through a light diffuser. New grill cloth installed. 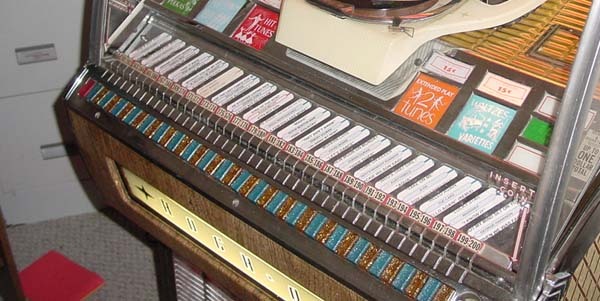 Since the 1455-D can play 200 different selections there isn't enough room on the front of the juke for that many title strips. So it has a rotating title drum. 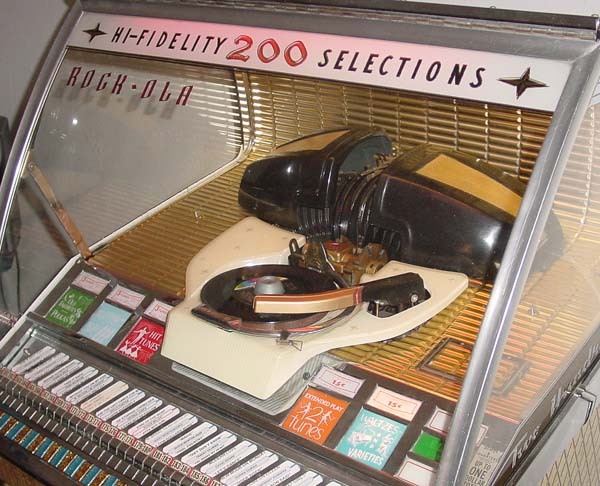 Click the program button to the left of the selection window and the drum rotates to show 40 different selections as well as illuminates one of the 5 different music categories above it. Click here to see a movie of the title drum rotating! 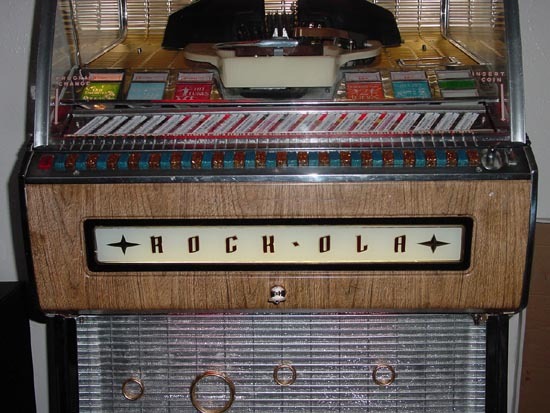 Special Notes: The 1455 D was the first Rock-ola Jukebox to play both standard and EP (extended play) records. 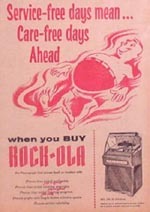 Here is the advertisement flyer for the Rock-ola 1455-D Jukebox. 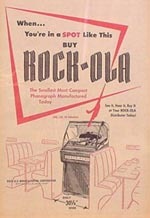 As pictured below, the Rock-ola 1455 Jukebox was featured on the cover of Chuck Berry's Capitol Records Album "New Jukebox Hits"